Resume writing, mock interviews and dressing for success were all a part of a special week sponsored by the Rankin College of Business (RCB) at Southern Arkansas University. The RCB recently hosted its first annual Backpack to Briefcase week from Oct. 8-12, 2018. The first day of the event featured a class entitled “Internships: Student Experiences,” which included a panel of four current SAU students who participated in internships over the summer. The second class that day was entitled “Resume and Cover Letter Workshops” – a class designed to help students with professional techniques on building a resume so they begin looking for their first jobs out of college. The second day of the event also included two classes. The first was “Your Social Media Presence,” which gave students advice and direction on building their profile online. Later that day, students learned to “Dress for Success” while interviewing for jobs and on the job site. Wednesday included a session of mock interviews that allowed students to go through a simulated job interview. 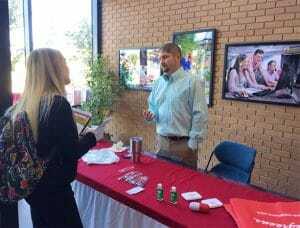 On Thursday, the RCB hosted its annual Career Fair that brought local and regional businesses to campus to talk to students about possible career opportunities. Other events during the week included a discussion on “Where Can I Go with a Business Degree,” a workshop on “Business Etiquette,” and an opportunity for students to have professional pictures taken for their LinkedIn pages. “This was our first year for the Backpack to Briefcase week. We appreciate all of the students and business owners who took part. We’ve already got some ideas we want to incorporate into the event and make it even better next year,” said Sronce.